Lovely light and modern house, located at the edge of the village Heches. You can reach the bakery on foot for fresh croissants in the morning, as well as the local cafe with terrace in the evening Only half an hour away from the Spanish border and an hour from Lourdes. Saint Lary is also known as a spa, and is a very idyllic mountain village. But you will also enjoy yourself here in summer, on the terrace of your own pool. If you're more sporty, then there are various Cols for you to cycle, or long hikes in the mountains. The house boasts a living room, dining room and well-equipped kitchen. On the first floor there are 4 bedrooms and 2 bathrooms. Due to the mezzanine, this house is not suitable for families with small children. 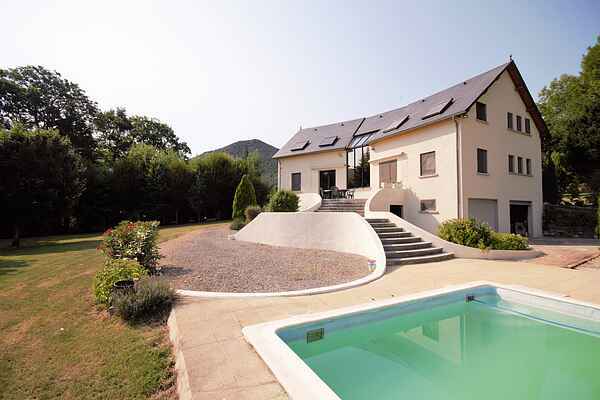 The residence offers stunning panoramic views of the foothills of the Pyrenees. A great base for discovering the most southwestern departments. However, the cities of Pamplona and Lourdes are also certainly worth a visit. Perfect starting point for bicycle tours. Conquer the Tourmalet, the Col d'Aspin and the Col de Peyresourde.